$18.00 This item is selling for $18.00 on eBay. 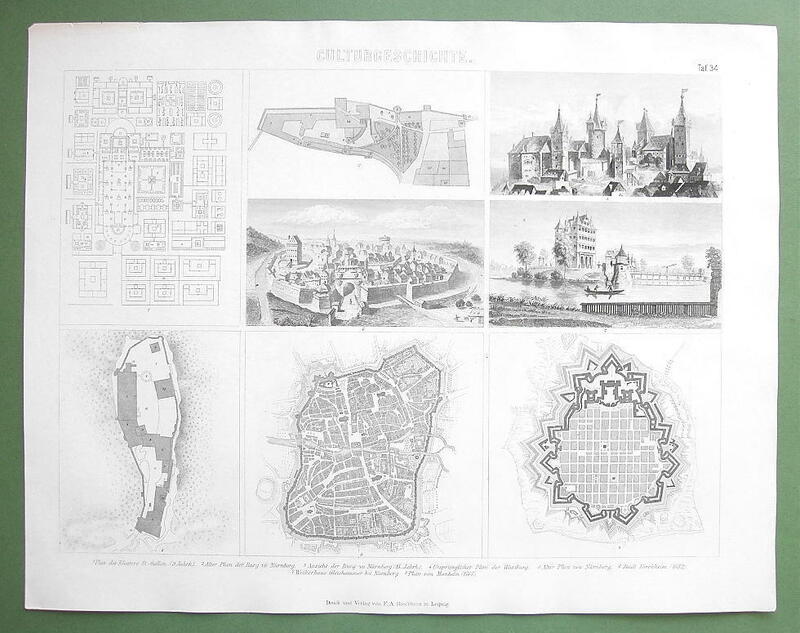 Medieval Towns Another Quality Print from Martin2001 Type of print: Steel engraving - Original vintage antique print Year of printing: 1870s Artist - Engraver - Publisher: n/a - n/a - Druck und Verlag F.A Brockhaus, Leipzig. Condition: Excellent - Very good - Good - Fair. Overall dimensions of print: Including blank margins: 10 x 13.5 inches. 1 inch = 2,54 cm. Type of paper: Thick - Heavier - Medium heavy - Slightly heavier - Thin. Reverse side: Blank - With text or pictures Notes: Green border around the print is just a contrasting background on which the print was photographed, it is not part of the print. Legend to the illustrations in the print: 1. Ground plan of the monastery of St. Gallen (9th Century), 2. Ground plan and 3. Elevation of the castle of Nuremberg (15th Century), 4. Original plan of the castle of Wartburg (Thuringina Forest, Germany), Plan of the old city of Nuremberg, 6. City of Forcheim (1632), 7. Place of refuge, castle of Gleishammer, near Nuremberg, 8. Plan of Mannheim (1767). Martin2001 Satisfaction Guaranteed Policy ! Any print purchased from us may be returned for any reason for a full refund including all postage. findhist findgail Powered by Turbo Lister The free listing tool. List your items fast and easy and manage your active items.